Last month, Deaf student Mohd Farhan bring the interesting products to make everyone aware about what deaf community need for.... 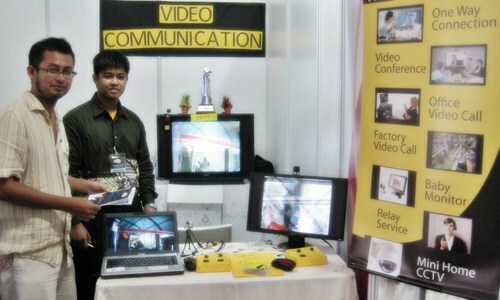 He also like to express his creativity power when he gain an idea to create new product, Video Communication. That is why he participated in the Festival Malaysia Inovatif 2010, Bukit Jalil National Sports Complex, Kuala Lumpur on 24 and 25th November 2010. Check out the Utusan Malaysia Online website. His product developed based on technology concept video conference to respond problem, namely communication between Deaf employer and Deaf employees at workplace. For example, a manager/supervisor can communicate with workers that were in level or space that separate and also monitor work process by television and webcam. It don't use Internet technology because according the inventor, it only involve network system based on video cable and will be more rewarding if Internet network does not work. He grabs the first place in Pertandingan Inovasi Peringkat Zon Tengah (Kategori OKU) which held in Malacca. He also accept a cash prize RM 3,000.00. Congratulation to Mohd Farhan! The Connecting Deaf Malaysia in Facebook are very happy with his creation product and encourage him to make the product developed based on technology concept video conference to respond problem for Deaf Community Malaysia. I am proud with Mohd Farhan, young deaf student! I am very happy when he show an interest to study in the Multimedia University after I gave my speech to Deaf and hearing students during the Motivating Deaf Youth & Career Experience Sharing Workshop! Today, Mohd Farhan and his deaf friend, Rachel are studying the Diploma IT in Multimedia University (MMU). If you want to know some about the universities/ colleges can accept Deaf students in Malaysia, please check out this article.